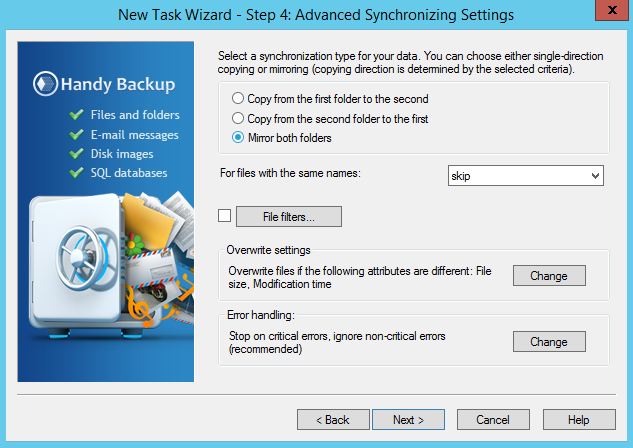 Handy Backup is the effective syncing solution capable to synchronize files between servers or any other two computers. As well as synchronize your laptop and desktop, PC and mobile devices, external drives, NAS units or other data sources, including synchronizing via Internet. If you have more than one machine containing some of your valuable data, the difference between data on each machine has a tendency to grow constantly. To eliminate the discordance caused by this difference, please synchronize files between computers. Here we will describe some techniques and methods capable to synchronize files between computers (or else, keeping another computer in actual data state), allowed by Handy Backup under Windows 8.1, Windows 7 and other modern editions of Windows (including servers). This is the fastest and simplest method for synchronizing the two machines in some local network, such as synchronizing laptop and desktop on the home network. A drive connected to the network is used as a synchronization data storage. This slow but undemanding method requires a USB drive pen or external disk. The syncing process divides into two phases; firstly, one of computers synchronizes with a drive as “first folder”, and then another computer syncs as “second”. Another method of local or global network data synchronization is an implementation of syncing through some FTP server, accessible by both computers. It is sometimes a best way to synchronize files between servers. This is the most advanced and modern method of data synchronization. An account on some popular commercial cloud, like Windows Azure, Google Drive or Dropbox, is used as a storage for syncing. Any of these methods can give you some advantage in a particular case. For example, to synchronize Favorites between computers, online methods are more effective then offline. In other hand, syncing via removable drives provides also an advantage of “extra” backup for your data. 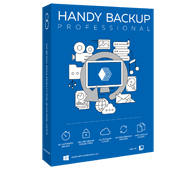 Handy Backup Professional provides you the best choice of devices and methods of synchronization between two or several computers! Free 30-days trial version! If you want to synchronize computers, e.g. laptop and desktop, when using Handy Backup as your synchronization files program, please firstly select one of sync methods described before. Here we will tell you about syncing via the network drive, used for storing a common dataset. To set up a task capable to synchronize files across multiple users, please follow the sequence described below on each computer you will plan to synchronize! Start Handy Backup and make a new task by pressing Ctrl+N or by clicking on the menu/panel “New task…” option. Select a synchronization task. 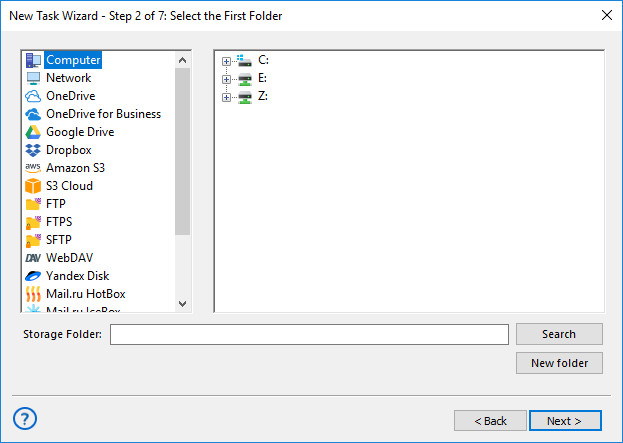 Choose a folder you will plan to synchronize on the computer on the Step 2. Then go to Step 3 and choose a folder located on your network drive as the second folder. On a Step 4, select the “Mirror both folders” option for full synchronization (or other option for rewriting a content according to local computer status, depending of your task). Finish creating your task. Now for every time when a planned period of scheduling will occur, Handy Backup will automatically run the task, completing the file synchronization between a PC and a network drive folder. Note: To get full advantages of this method, you must create a similar task for each computer you will plan to synchronize such a way! To use this algorithm for other ways of synchronizing data between computers, the main difference will be another selection of data. Therefore, Handy Backup can be an effective “synchronize computers software”, regardless of physical or logical synchronization method you prefer! Synchronizing files between computers with Handy Backup is quick and effortless!